A curious diamondback terrapin crashed the Tabor Academy graduation this morning. 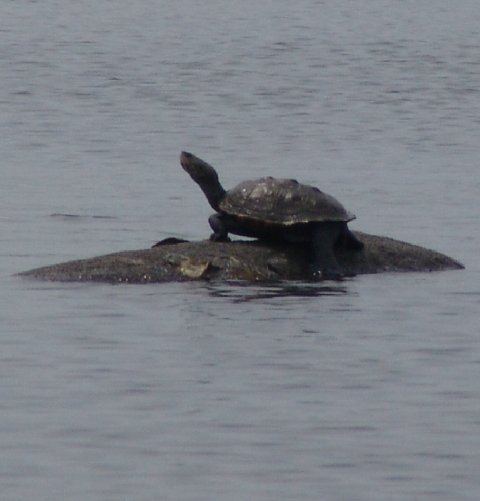 Although uninvited, she snagged the best seat in the harbor, a rock exposed by the receding tide. 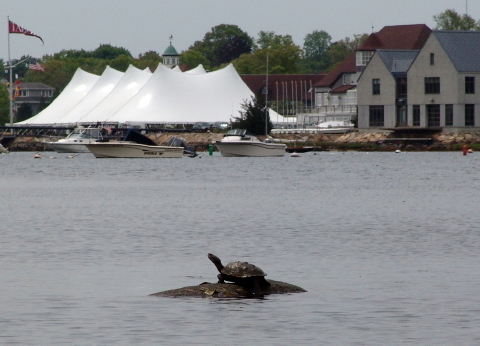 Her rock came with a clear unobstructed view of the festive graduation tent, as well as the Marine Science Center that she helped to build. 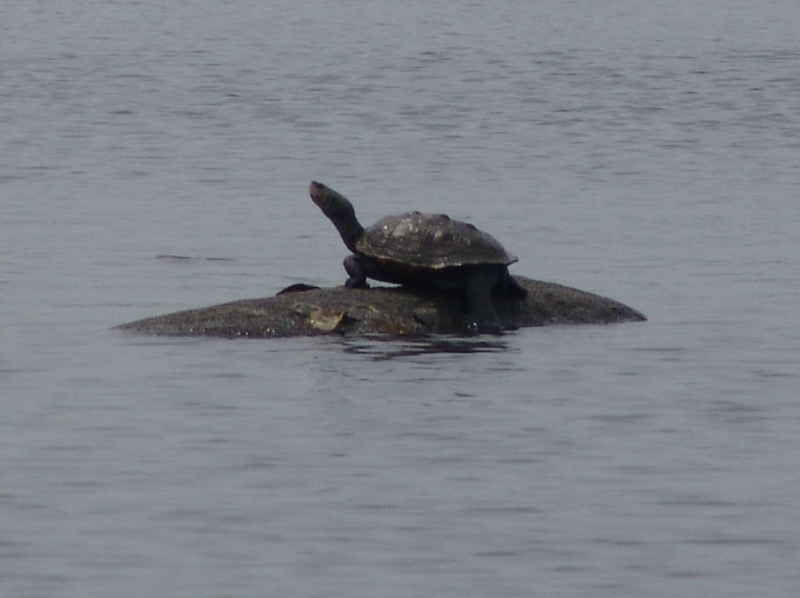 Turtles rock literally and figuratively, as illustrated by this mature female perched in the middle of Sippican Harbor. 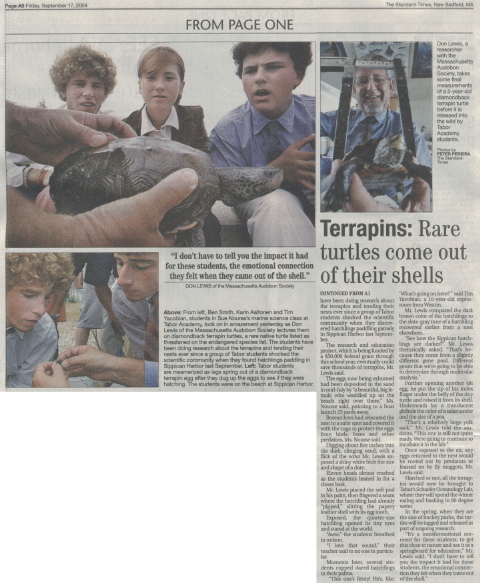 If anything brought together the leadership of town (Marion) and gown (Tabor Academy), it was the unshakeable belief, stentorianly expressed in a voice akin to that of legendary Foghorn J. Leghorn, “There are NO, I say NO, turtles in Sippican Harbor” … any evidence to the contrary not withstanding. 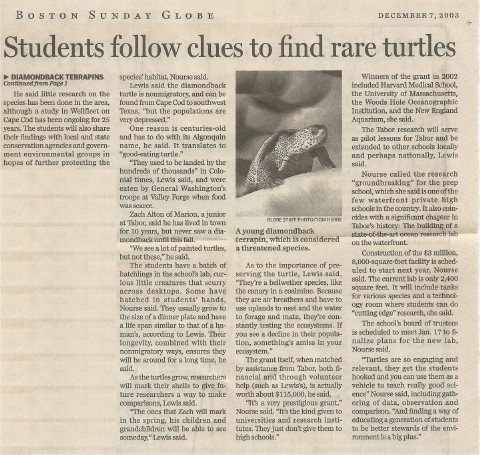 That evidence to the contrary was discovered by Jaeger Chair scholar Sue Wieber Nourse and her advanced marine science students at Tabor Academy beginning in the spring of 2003. 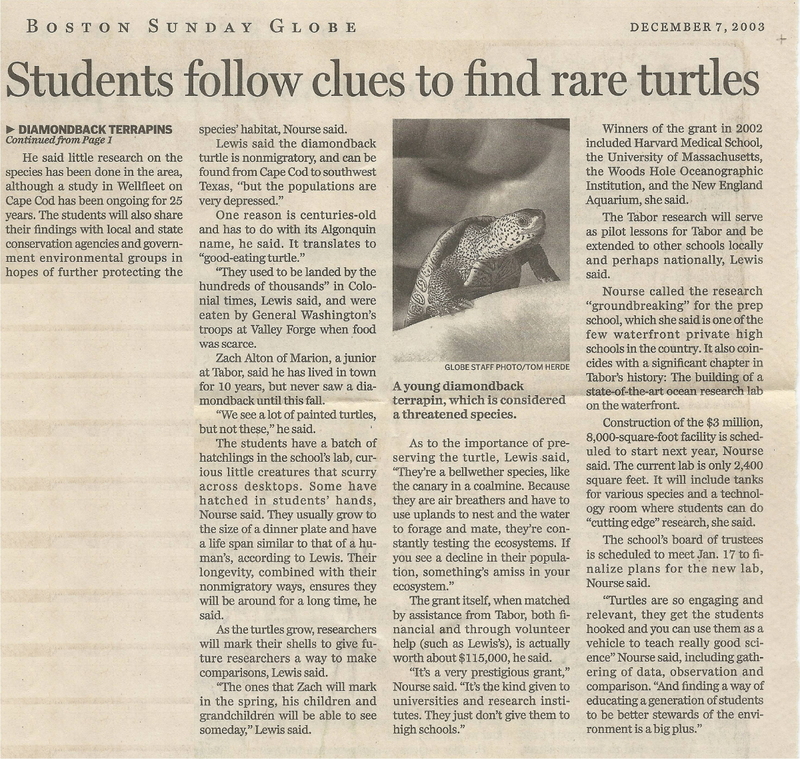 As reported in the Boston Globe in December 2003, Sue Wieber Nourse’s breakthrough results led to a prestigious National Fish & Wildlife grant to export her hands-on research methodologies nationally. Her work also formed an illustrative practicum for the National Science Foundation’s COSEE (Centers for Ocean Science Education Excellence) initiative. 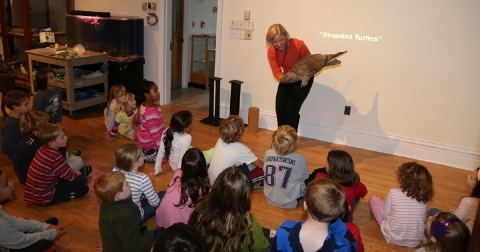 This signature marine science research program at Tabor Academy enlisted a consortium of SouthCoast and Cape Cod partners that included the NMFS Science Aquarium in Woods Hole, the National Marine Life Center, the Massachusetts Audubon Society, the Buttonwood Park Zoo and the Lloyd Center for the Environment. 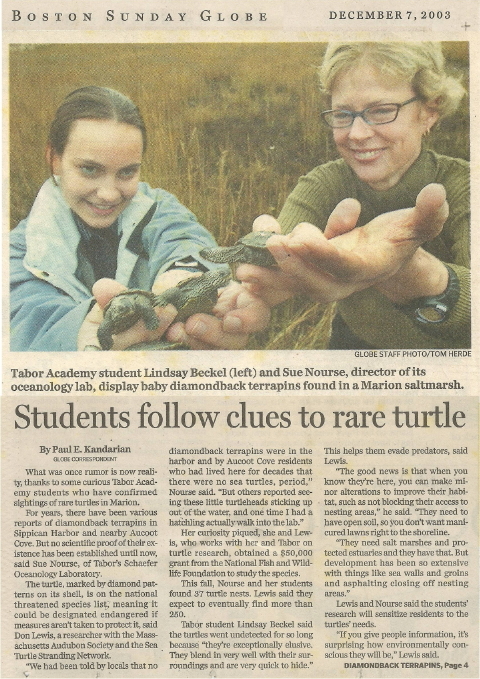 Under Sue Wieber Nourse’s guidance, advanced marine science students at Tabor Academy’s Schaefer Oceanology Lab scoured local barrier beaches and salt marsh systems to locate nesting sites and nursery habitat for elusive diamondback terrapins. 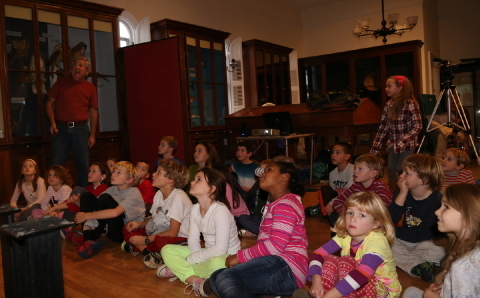 None had ever been discovered on the SouthCoast of Massachusetts. Her students soon identified a major nesting site off Buzzards Bay, and documented its presence and importance with Massachusetts Natural Heritage and Endangered Species Program (NHESP). Going through this formal research and documentation process ensures that vulnerable habitat is preserved, while at the same time, teaching students through personal hands-on actions what is required to effectively save endangered species and fragile habitat. While Sue Wieber Nourse held the Jaeger Chair, Tabor Academy remained the only secondary school in the nation engaged in such high level field research, analogous to ongoing studies at Hofstra University, University of Georgia, Davidson College, University of Texas, Virginia Institute of Marine Science, and several other colleges and universities on the Atlantic Coast. 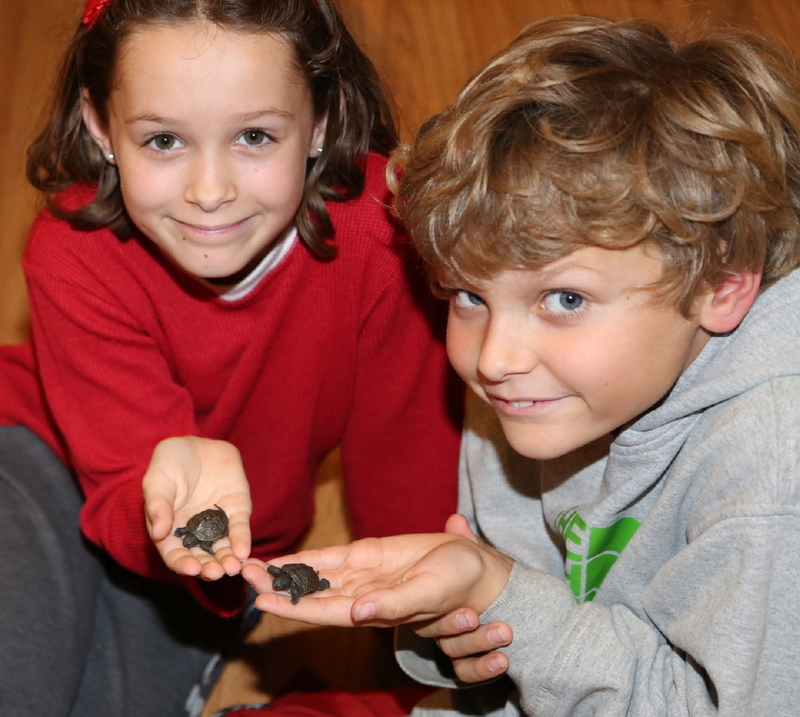 This celebrated marine science research breathed life into Tabor Academy’s slogan as the School by the Sea. By the Fall Semester 2004, the terrapin research program began to reap conservation dividends. Nests that students discovered in the Spring Semester were covered with predator excluders, and the turtle eggs had incubated in warm sand through the long, hot summer days. In September, Sue Wieber Nourse’s new marine science students savored the unique experience of watching baby terrapins hatch, putting an exclamation point on the success of this powerful and innovative research program. 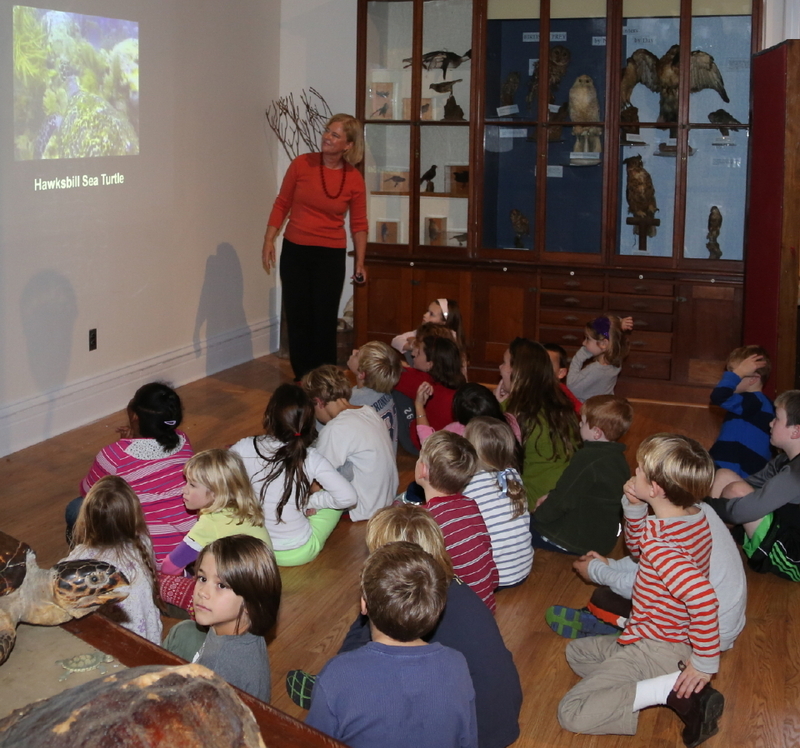 An exciting educational discovery transforms into a significant conservation event through the magic of hands-on learning. 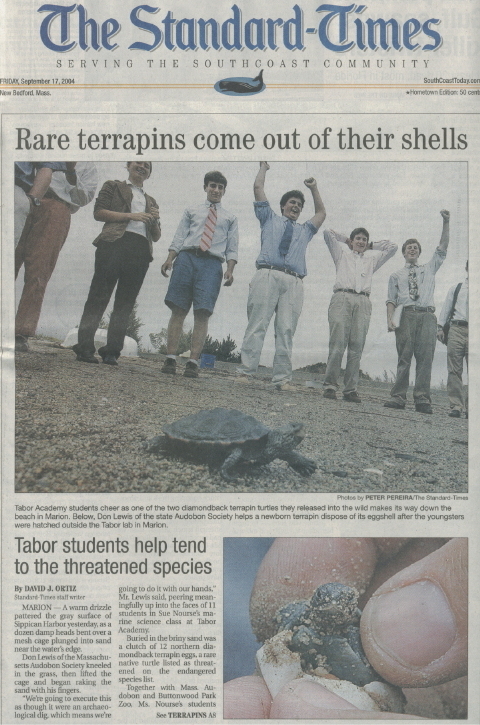 Entering its third research season with a now well established national reputation, the diamondback terrapin research program transitioned from the old Schaefer Oceanology Lab to the newly opened marine science center, dubbed by Tabor Academy as the Center for Marine and Nautical Sciences. 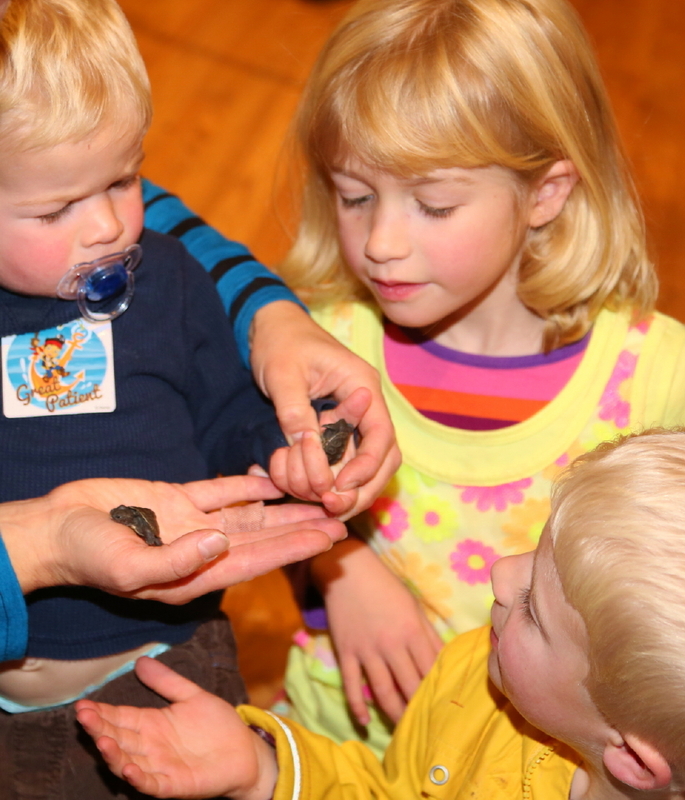 Spotlighting the critical importance of hands-on research as a highly effective tool in sparking a lifelong scientific curiosity within students, Sue Wieber Nourse keynoted the dedication of the center. 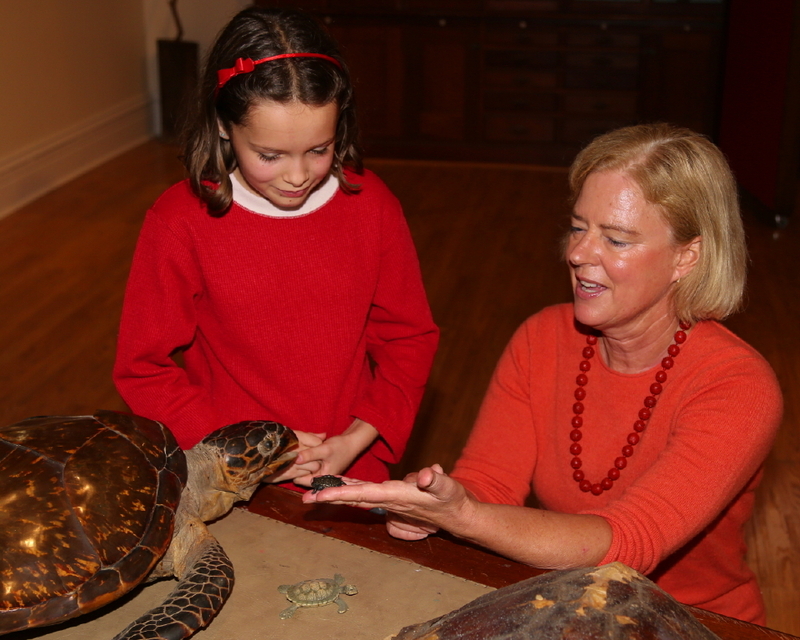 At the same ceremony, she received the Jaeger Chair for Marine Studies in recognition of her outstanding accomplishments on behalf of Tabor Academy and for her national leadership in science education. 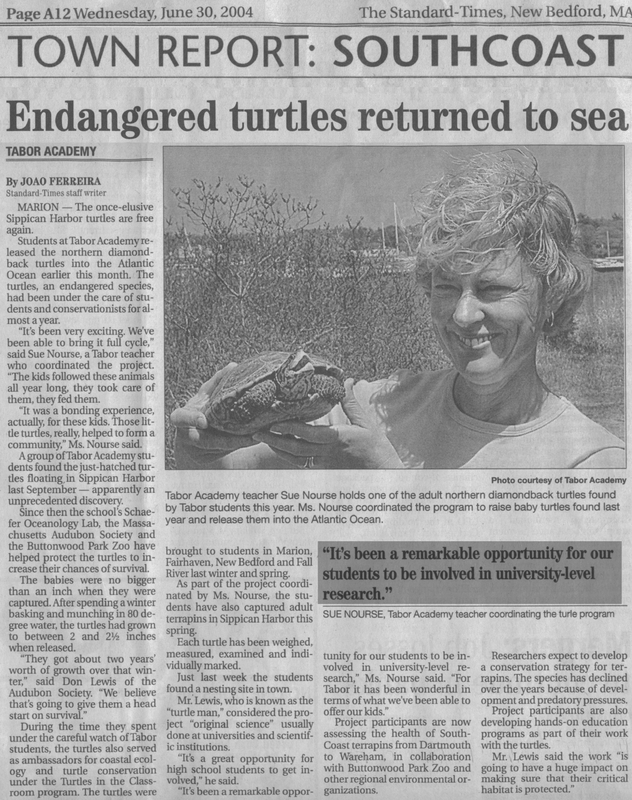 The diamondback terrapin research program ended at Tabor Academy in June 2008 when Sue Wieber Nourse received a year-long sabbatical, during which she co-founded Turtle Journal and subsequently assumed executive leadership of Cape Cod Consultants where she continues her breakthrough work in marine science research, environmental assessments, wildlife rescues, sensitive habitat restoration, endangered species conservation, and hands-on educational experiences in both formal and informal settings. A light rain sprinkled the South Coast of Massachusetts on Friday night with temperatures still hovering in the high 30s/low 40s. 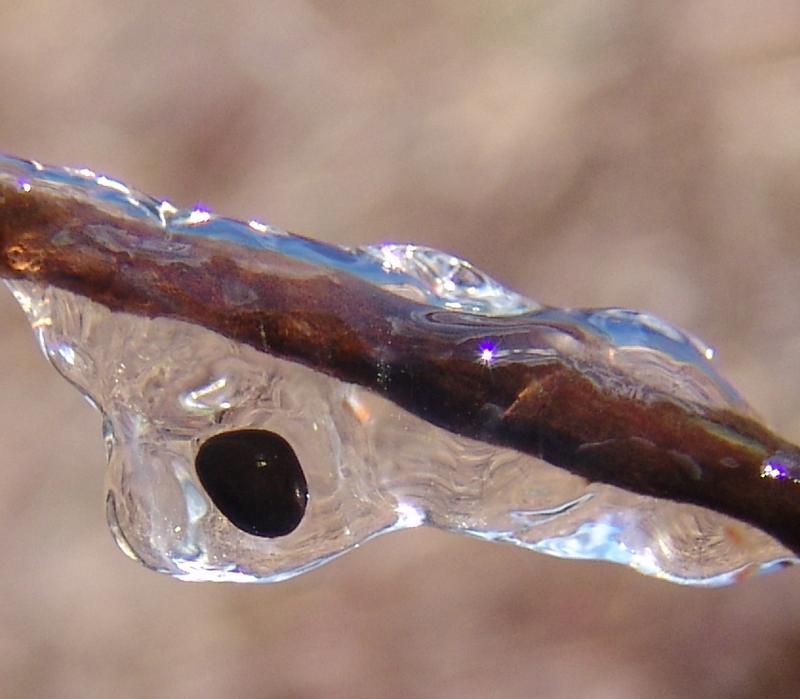 We had not yet seen any sign of spotted salamander mating congresses and no egg sacs so far this season because temperatures have been unfavorable. In fact, we experienced an April Fool’s Day snow storm this year. Nothing to write home about, only a couple of inches of heavy flakes, but still enough to delay the kick start to spring. 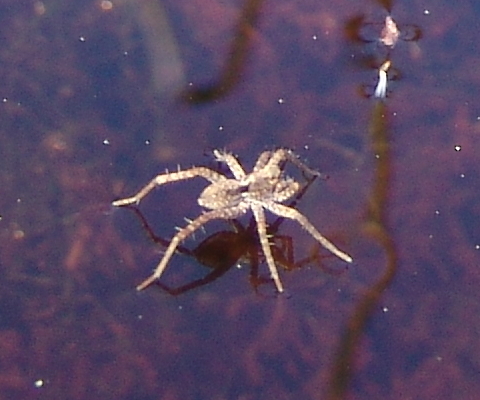 Even frogs and spring peepers have been few and far between. The wild seems eerily silent this year. 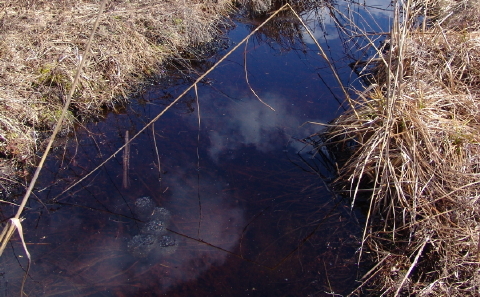 After last night’s gentle rain, Turtle Journal opted to scour the shallow channels of Marion’s abandoned Goldwitz Bog this morning, and we found a small concentration of spotted salamander egg sacs in the very early stage of development. 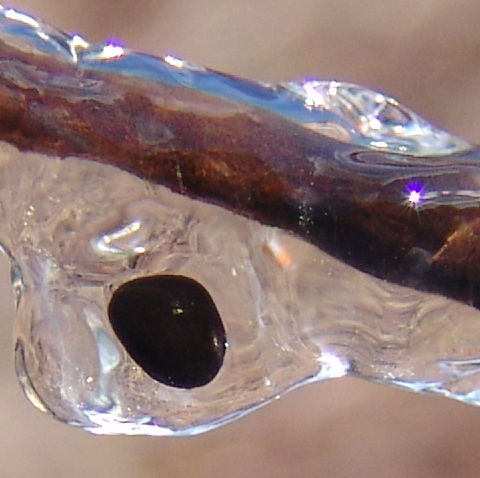 Obviously, since it was broad daylight, we saw no spotted salamander specimens. 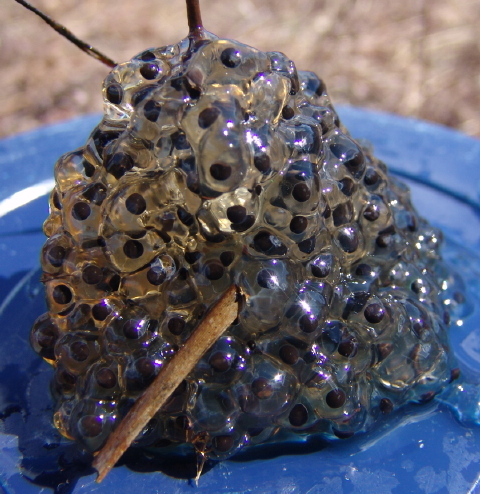 Today’s egg sacs were in the same approximate location of last year’s mating congress, although much, much fewer in number. We expect to see more mating activity over the coming nights, especially if there’s any warm rain in the forecast. Above our camera zooms in on the only egg sacs that we discovered today, April 2nd. 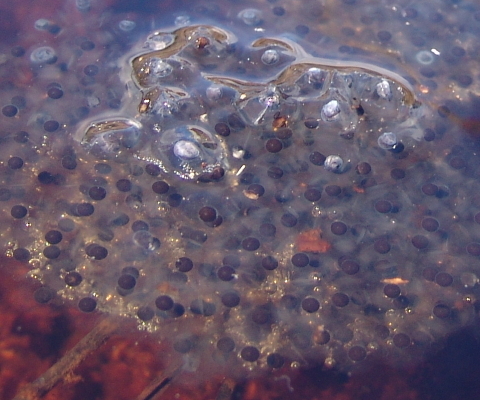 And the camera zooms even further to show the eggs/embryos in early stages of development. 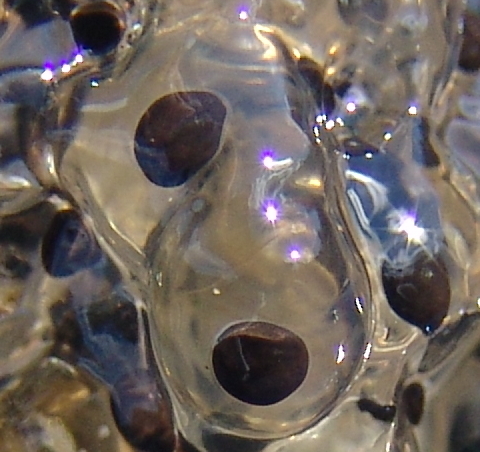 With an extreme close up of individual egg sacs, and comparing them to the video above, you can clearly see how early in the development process these larvae remain. 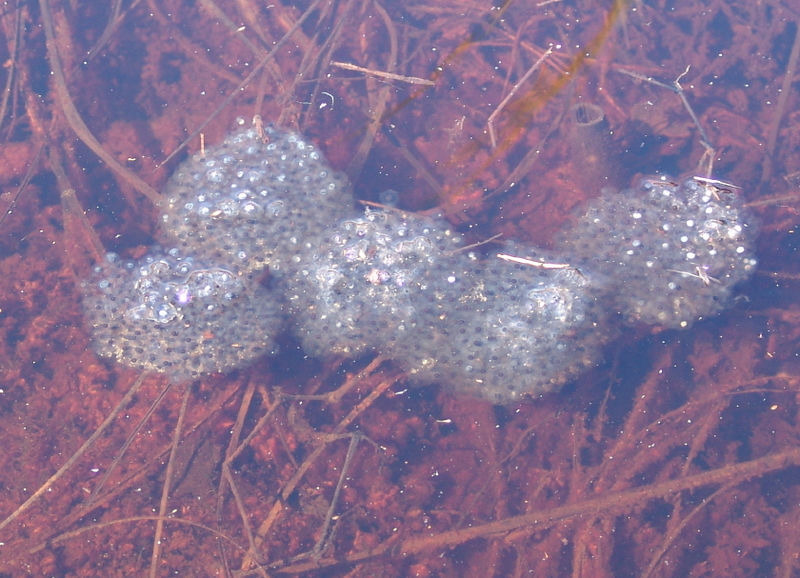 We suspect … based on our continuing observations of this area … that the eggs may have been deposited last night, April 1st/2nd. Sometimes we forget how important these events are to the entire eco-system as colonies of interesting critters erupt around salamander and frog mating aggregations, a magical time on the South Coast when the entire bog springs to life and to sound. 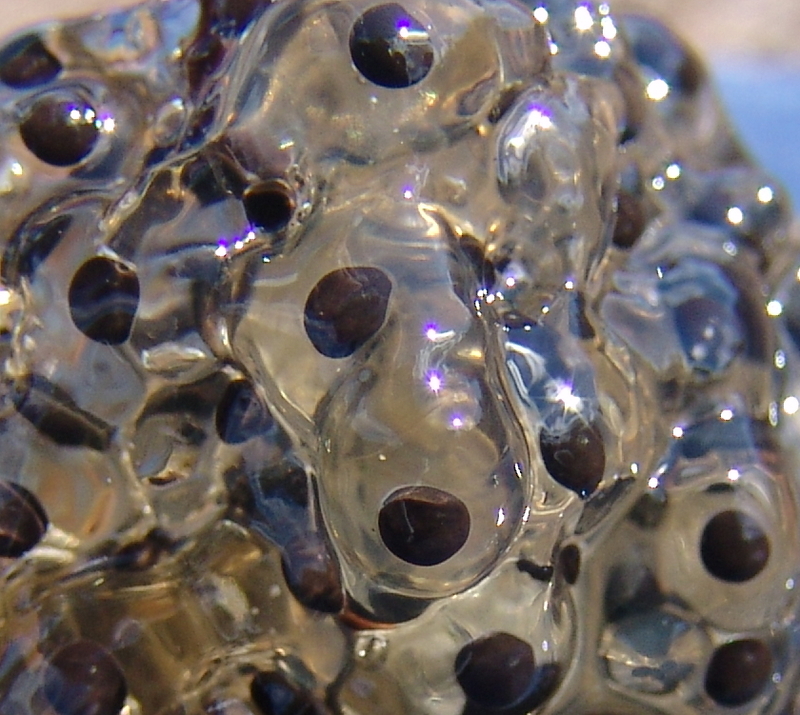 We leave you with a trilling chorus of “A Little Amphibian Night Music” … an original creation by the Slithering South Coast Croakers. L’art pour l’art, the French expression and philosophy that transformed itself into the haughty Latin ARS GRATIA ARTIS encircling the Metro-Goldwyn-Mayer roaring lion, championed the purity of art solely for art’s sake. Within this philosophy, a work of art possesses inherent and intrinsic value distinct from any moral lesson or utilitarian purpose. Art is simply art. While it may prove a difficult challenge to maintain that purist philosophy in the chic galaries and trendy studios of SoHo, the abandoned beaches of wintry Cape Cod afford the lonely pleasure of artistic expression beyond the smothering glare of adoring fans and nattering critics and without any thought of commercialism. In fact, ephemeral driftart goes unseen and unappreciated by anyone except its creators, transient flocks of waterfowl, a stray seal or two that may haul up to bask nearby, and a few layered, bundled, wind-blown and eccentric hikers. The Turtle Journal calls these creations driftart, a contraction of drift and art. 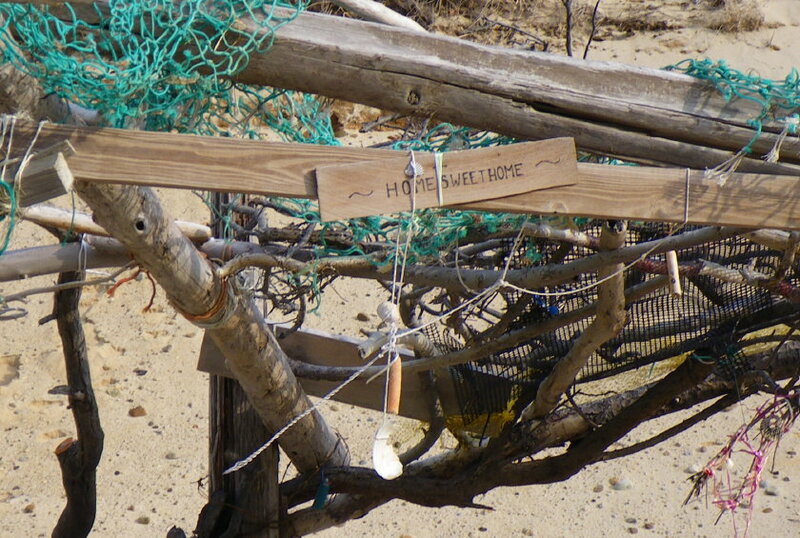 When we first explored the winter beaches of the Outer Cape, wandering miles from the nearest landing, we were surprised to encounter driftart scattered randomly along the Great Back Beach from Chatham to Provincetown, and the long, lonely stretches of bayside beach from Provincetown to Jeremy Point in Wellfleet, more than 45 miles of sand, surf, wrackline and little else from each November through March. Where nothing had been yesterday, a collage of flotsam and jetsam springs to life, created first by the inspiration of a single artist, then augmented by other hardy designers and shaped into a unique community artwork. Every few days until an Atlantic storm erases the entire masterpiece, someone adds a touch here or links existing objects there to invoke a new effect. Located quite literally in the middle of nowhere, seen by no one, shaped for the pure, simple pleasure of anonymous artists who create it, and vanishing into unnoticed oblivion within a blink of the storm god’s whim, these driftart works are a true manifestation of arts for art’s sake. Sightings of actual driftartists are as rare as credible photographs of bigfoot or glimpses of urban graffiti taggers. 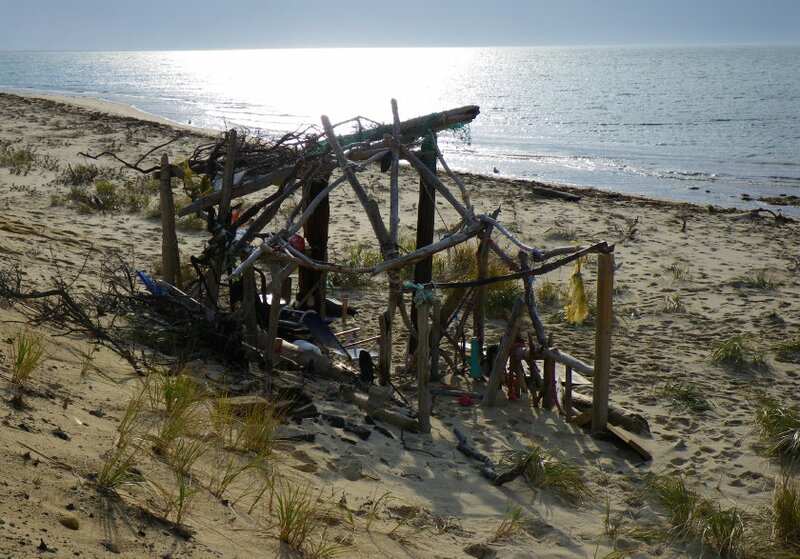 They create their works outside the view of civilization, during times when fleeting, summer civilization has returned to its mainland roots and when the Outer Cape has resumed its natural state of raw, uncontrollable wildness. We suspect you’d be surprised by their identity and they’d be equally surprised to be viewed as artists. Yet, we like to think of these individuals as kindred warriors to those prehistoric cave artists of 30 millennia ago who created masterpieces of expression in cryptic, inaccessible underground locations unlikely ever to be seen by a fawning public. 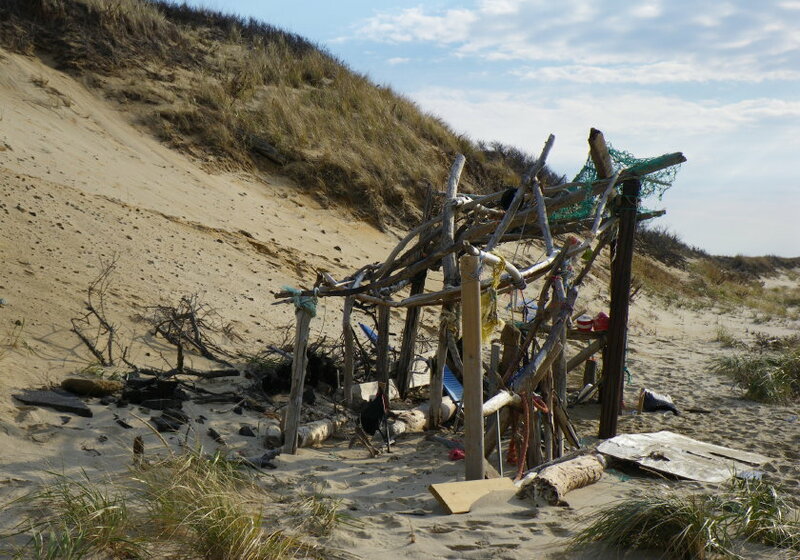 And so it is with Cape Cod driftartists who build their creations along equally inaccessible winter beaches with the sure knowledge that their work will soon disappear unseen and unnoticed into the ocean depths. Art of art’s sake. Ars gratia artis. L’art pour l’art. You are currently browsing the archives for the Education and Art category.